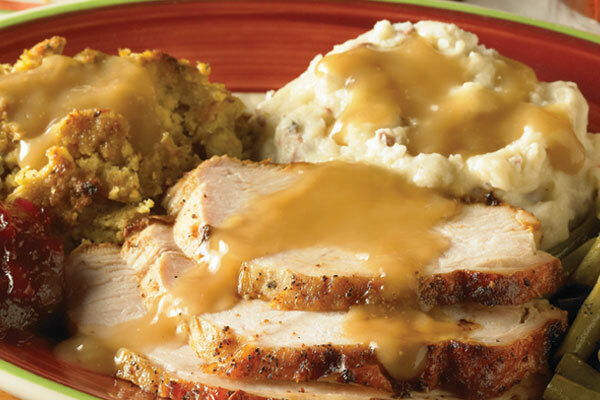 I’m sharing one of my prized recipes just in time for Thanksgiving. This is one people will talk about long after it’s gone and they’ll probably ask for the recipe. 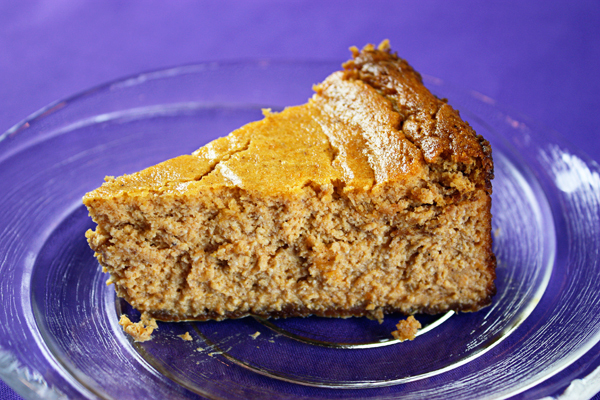 My lightened pumpkin cheesecake is made using all reduced fat ingredients so it’s a healthier dessert, perfect after you’ve stuffed yourself senseless with turkey. This lighter cheesecake won’t weigh you down and the recipe is fairly simple but you will need a springform pan. The crust is just graham crackers sprinkled on the bottom so there’s no heavy butter-laden crust. And the secret to this light and airy cake is to beat the egg whites separately and fold them in at the end. I get the best results using Daisy Brand light sour cream and Philadelphia brand 1/3 less fat cream cheese. I tried neufchatel but didn’t like the result, and I would never use Knudsen reduced fat sour cream for anything! Got 15 minutes? Then you have time to make a quick and easy meal. This black bean quesadilla is my go-to meal when I’m pressed for time and with the holidays coming, I’ll be having lots of quesadillas. Of course, I use my own homemade whole wheat tortillas, which I usually have on hand, but you can use store-bought ones too. Try to find them without saturated fat. I realize it’s convenient to use pre-shredded cheese but because of the additives it won’t melt as well as using a block of cheese. So take the extra 30 seconds – yes, that’s how long it takes to shred 2 ounces of cheese – and you’ll have a nice “cheesy on the inside, crispy on the outside” quesadilla. 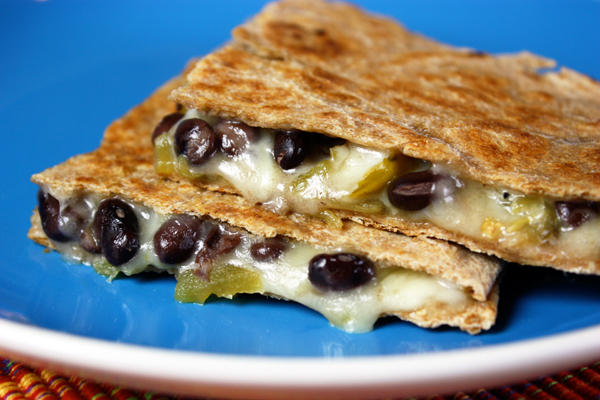 If you like spicy food, you will love the spicy version of my black bean quesadilla. Simply replace the reduced fat jack cheese with reduced fat pepperjack, and use the hot canned diced chiles. Oooh, Mama! I absolutely love my beet & cabbage borscht. It has a complex flavor but is really easy to make. You basically put all the ingredients in a pot and cook. It’s the best soup I know to restore electrolytes and boost your immune system. Every time I make this soup, I devour it in no time. I think your body knows when it’s getting something super healthy and yesterday I had two big bowls of it for dinner – nothing else. 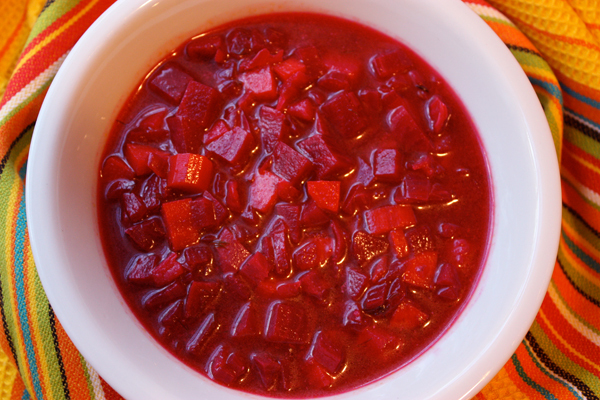 We Polish people usually add a little dollop of sour cream to our borscht. My dad had his own way of eating it. Instead of adding diced potatoes to the soup, he would make a side of mashed potatoes and put some potatoes in his spoon, then dip it in the soup so every bite had mashed potatoes and delicious borscht. Yummm. Beets alone are an anti-aging powerhouse. They are said to stabilize blood sugar & cholesterol, support the liver & urinary tract, and help fight heart disease and cancer. The rich variety of other vegetables can protect against prostate, lung and other cancers, heart disease, macular degeneration and memory loss. 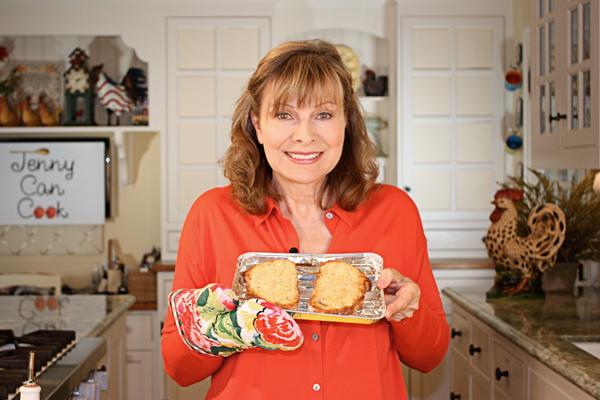 Here’s the How-To video for my easy garlic bread. You must see how quick and easy it is to make fresh, homemade garlic bread. I swear I can smell the garlic just looking at a picture of it! 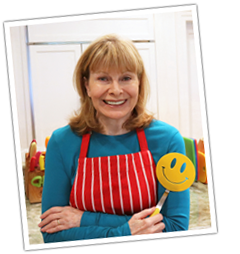 I just made some last night in my toaster oven and had it with a big bowl of vegetable-bean soup. Make sure you serve it warm. Is there anything better to have with a salad than garlic bread? I love it! And since I make my own garlic bread all the time, I keep it simple and fast. What I usually do is preheat the oven (actually, I make mine in a toaster oven), prepare the bread, which takes less than 5 minutes, and I set it aside. Then I make my salad and dinner. When it’s ready for the table, I pop the garlic bread into the oven. Then I warm a plate, line it with a cloth napkin, and bring the fresh warm garlic bread to the table because fresh out of the oven is the best way to have it. And oooh, that smell! I like to use thick slices of sourdough bread because you get a soft, golden top and nice crispy edges. And any day that I bake a loaf of bread, that’s always a garlic bread day. If you’ve ever had homemade garlic bread on homemade bread, well… I’m pretty sure you had three slices! My easy recipe makes two slices so double it up if you need more. Line your baking sheet with foil and there’s no cleanup.